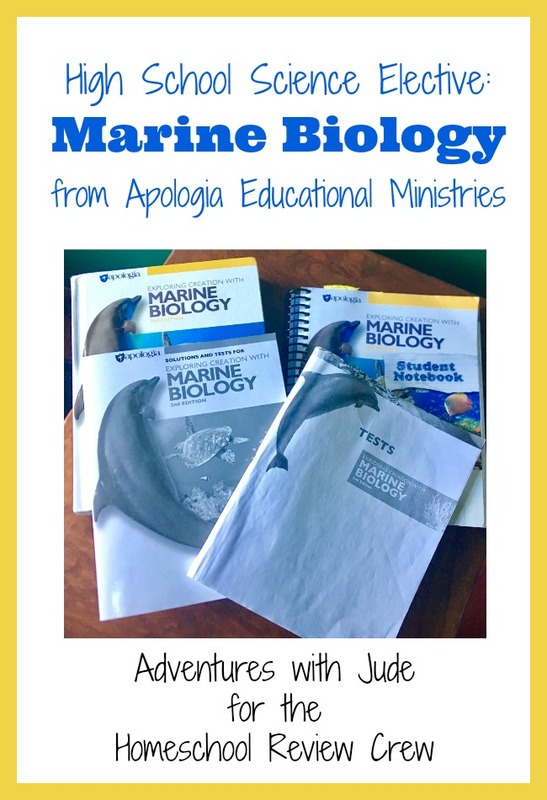 This is not our first Apologia Educational Ministries science program review, and their high school Marine Biology program is a bit of a homecoming for us. 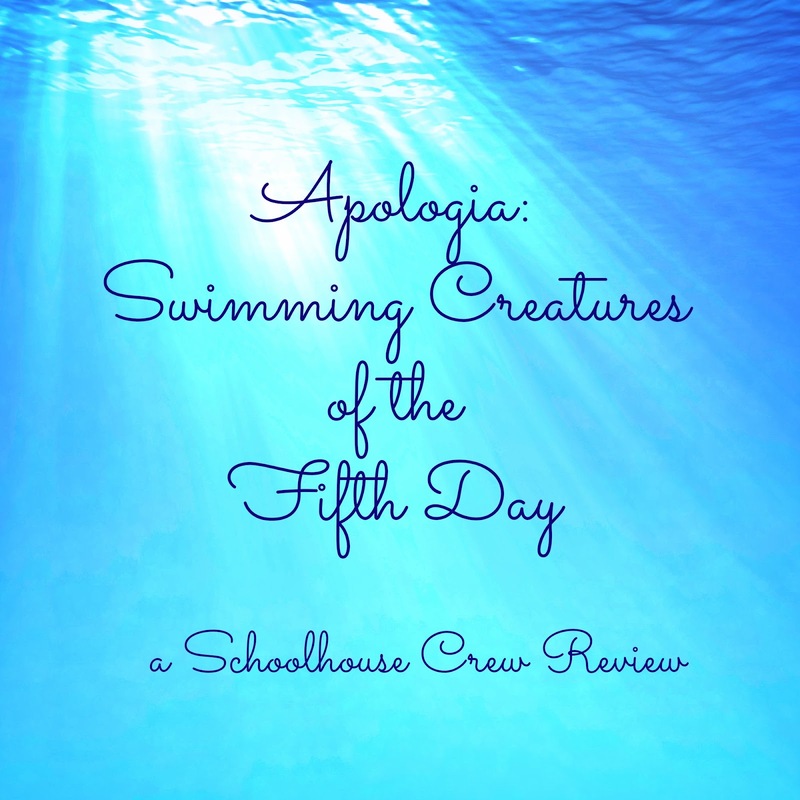 While we've studied with several Apologia curricula, our very first Crew review was of their elementary level Swimming Creatures of the Fifth Day. It was one of Jude's first formal homeschool programs and remains a favorite almost five years later, so I was definitely interested when we had an opportunity to use their upper-level marine biology program with Matthew. To make this more manageable, I'm going to try to divide it into chunks by learning material. As I tried to write my first attempts at this review, I found myself getting lost in all the information. When I write reviews, I tend to organize my thoughts in my head and let ideas flow from there, but I had to actually break out pen and paper, sort everything out in hard copy, and start over. There was so much about this program to share that the review overwhelmed itself. This program, when completed with the labs, is a full high school science credit. 11th grader Matthew is elated to be getting to the "electives phase" of high school, and this is providing a novel elective science for him. Completion of a biology course is a pre-requisite for the program, and I'd definitely agree with that. It assumes the student has an understanding of biologic processes, like cell structure and function, photosynthesis, reproduction, etc., and while it does explain some basics in context, it doesn't describe them in detail. Having a good biology foundation is definitely an asset. However, it doesn't have to be Apologia's biology -- Matthew's course was not, but so far it hasn't been a problem. While I was very interested in the program because of our prior experience, I was also a bit skittish after Luke and Apologia's high school Chemistry course didn't "gel" well. However, it's a different class and different kid, so I cautiously approached it with an open mind. I think that we can call this experience a success! The Student Notebook is a huge, everything-you-need, spiral bound volume. It's actually as thick as the textbook! Everything a student needs to master the material is included. It gives the student a solid frame for learning. I used to think "I never had this, and somehow survived!" but the more education evolves, I begin to wish I had more structure and direction than a blank composition book and the instructions "learn to take good notes." Honestly, I think a large reason why this has been a success for Matthew while Chemistry and Luke didn't get along is the Student Notebook. At the start of the Notebook is a schedule layout. I am always so excited when a course lays itself out, and it's not Mama handing out the assignments. Somehow, when it's "what the book says," there aren't any "But can't I read four pages instead of six?" negotiation attempts. 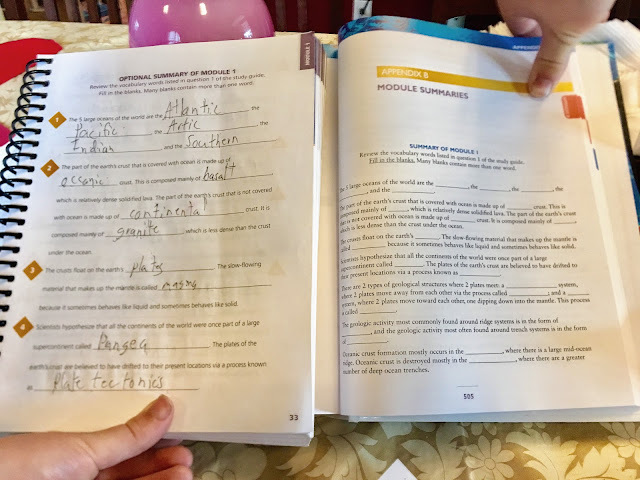 The "On Your Own" questions that are at the end of each textbook section are included, as well as a fill-in-the-blanks study guide. Matthew struggles to write "complete" answers, and I think having a clearly defined space helps him. He has enough space to write several lines of text, and I've pointed out if they're giving him that much space, the answer needs to be more than four words. There are actually two study guide options included. Matthew has been doing both, at different paces. The first one is more of a traditional question-and-answer format, with definitions and short answer questions. Many of them are not direct "what is this, find it in the text" questions, and involve using critical thinking skills. Matthew has been filling that one in as he goes through the Module (chapter), at the end of each day's lessons. The second one is a fill-in-the-blank that uses vocabulary words from the text. It's a bit more literal, with some leading and hand-holding. (You can see a sample of it in the next section.) Matthew completes that at the end of the unit, doing a first "what do I remember" pass, followed by one last read-through of notes to prep for his test. After taking the first test, I can say that it is not terribly hard to do well on the tests if you really put forth a good effort on reading and completing the review questions. The constant repetition worked well for the "classical style learner" in Matthew. Have you ever tried to look at a text book and your eyes just start to glaze over? These are not your average textbook. If you're a Charlotte Mason-style learner, you'll recognize the "living book" approach of a textbook written by a passionate author and not a committee. While they are chock-full of information, they aren't just pages and pages of text. Larger chunks of information are broken up visually with headings, pictures, and key terms. The writing and layout pull the student through the chapter, inciting them to keep reading, rather than leaving them thinking "Is it the end yet?" These breaks help clue a student into "This is important, write it down!" The text is also studded with lab opportunities. (There are five in the first module alone!) There are some that require extra materials (like a small shark for dissection -- the former biology major in me is looking forward to that! ), but some use basic household items. After reading through the materials needed for the "Mountain Formation from Plate Movement" experiment, I realized that the equal parts of salt and brown sugar it used didn't necessarily need to be wasted. He used a sealable container and extra-clean hands; when we were done, it became part of a tasty brine for that night's pork ribs. 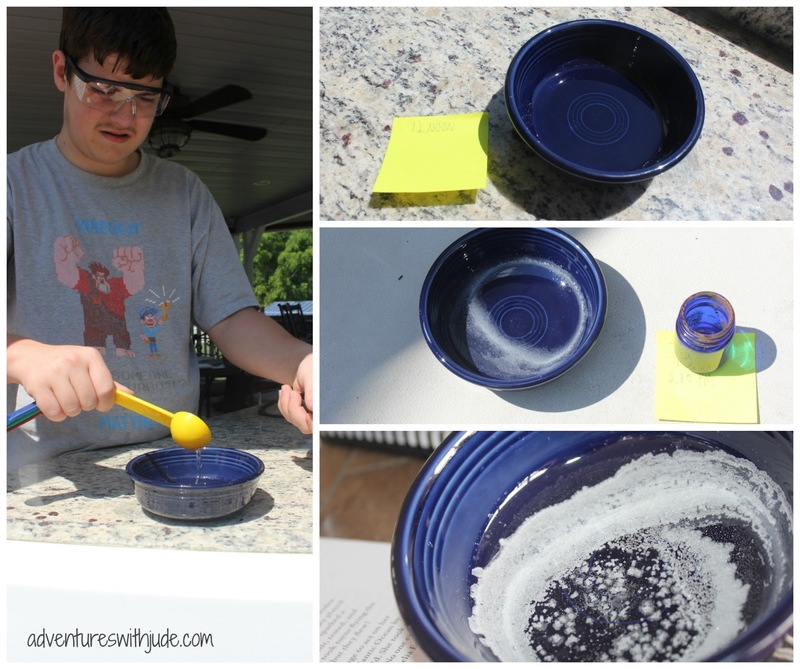 The first module focuses on oceanography basics, and most of our experiments involved household/kitchen items. This one used salt and water to help demonstrate the ocean's salinity and evaporation/concentration. We did have two (relatively minor) issues with the textbook. First, the glossary is really skimpy. While some of the key terms are clearly defined separately from the rest of the text in the chapters themselves, some require a bit of discernment. While it's good to practice learning to pull definitions from context, having the words defined in the glossary reinforces a specific definition (and gives confidence with a "Yeah, you got that one right!"). Matthew has learned to have a dictionary handy for words that he can understand the concept of but doesn't really have a clear idea of a concise explanation. We also wished there had been a Periodic Table printed in the book. On the one hand, I recognize it's not a chemistry book. However, Matthew found that when taking notes, writing "Na" instead of "salt" or "P" instead of "phosphorus" saved space. (It's only a few letters, but when space is finite, it's a logical abbreviation.) Even having completed chemistry, sometimes Matthew just needed help remembering something. It was an easy fix to print one and glue it onto the inside cover, but it's the sort of simple, basic scientific tool that I think all higher level science books ought to include. The textbook is available as part of the basic program set. Each chapter contains the question-and-answer Study Guide, and the fill-in Module Studies are compiled into an index at the back. This means you don't need the Student Notebook to complete the program -- you could answer the questions onto paper. However, I would really recommend using the Notebook if you have a student who benefits from having questions with the answers (versus just answers written separately). Also, just writing the one or two-word answers to fill in the Module Summaries blanks doesn't provide a coherent review - and it's a lot of copying to keep them in context. There's not a whole lot to go into about these. They're kind of self-explanatory. I like that all of the answers are in one book, and I'm not hunting different manuals all the time. It also makes the book slightly thicker -- thicker is harder for me to lose! The tests are separate from the answer key, and I can hand Matthew the test booklet without worrying about any temptations. 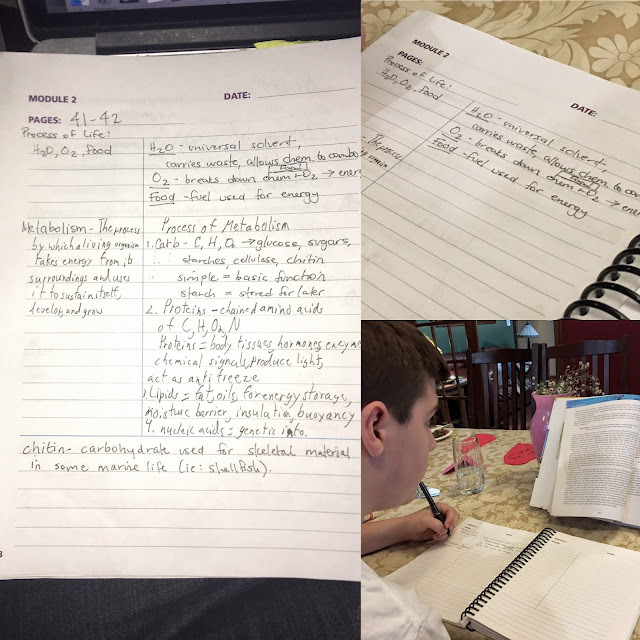 He wrote his answers on loose leaf; after seeing the space allotted in the course notebook, he had a good idea of what was expected, so I wasn't so concerned about a stack of blank lines staring back at him. This is a resource that we actually didn't find useful for us, for a few reasons. First, it's an MP3 CD, not a "regular" audio CD. Honestly, I'm not sure of the difference, beyond it only worked in the CD/DV drive for our (Mac) computers. Apparently, not all CD players can play MP3 CDs, so if you have a computer that doesn't have CD capability (like a Chromebook), make sure whatever you do have to play CDs can handle this kind. I thought that it might be useful for Matthew because sometimes he struggles to simultaneously silently read and process/comprehend text. He will often read things aloud, which forces him to slow down and focus on what he's reading, rather than racing through to the end. I liked that the recording reads all of the text, including the information boxes and illustrations. However, I found that often he'd lose focus and stop listening actively/following along, and the narration would devolve into background noise. We found it was better to go back to him reading sections aloud (stopping to take notes helped create natural breaks) rather than having it read to him. While it wasn't a good fit for us, I think if you have a student who does well with audiobooks or remains focused when listening/reading along, it is an excellent addition to the program. This is a keeper of a program! When we first were chosen, Matthew wasn't sure he wanted to do marine biology. He's not sure what he does want to do for a career, but "stuff with fish" isn't it. However, having completed a Geology course, the first module that discussed plate tectonics and ocean movement piqued his interest. A strong academic program combined with of opportunities for hands-on learning with experiments helped make this program come to life. Revisiting some of the concepts he learned in biology and chemistry triggered thoughts of "Huh...maybe that wasn't all useless gibberish." Anatomy and Physiology or Advance Biology are typical science elective offerings, but not many high schoolers get to study marine biology. This program, both in topic and presentation, truly supports the uniqueness of homeschooling high school. Note: If you have a K-6 student looking to study marine biology, check out our review of Apologia's Swimming Creatures of the Fifth Day. 55 Crew families have spent the last six weeks exploring under the sea. Click the Crew banner below to surf the web to their reviews.